Located in the Carlmont area of Belmont, this superior area enjoys a “Banana Belt” micro-climate with warmer evenings for outdoor activities while Altura Way proper offers a secluded cul-de-sac locality. 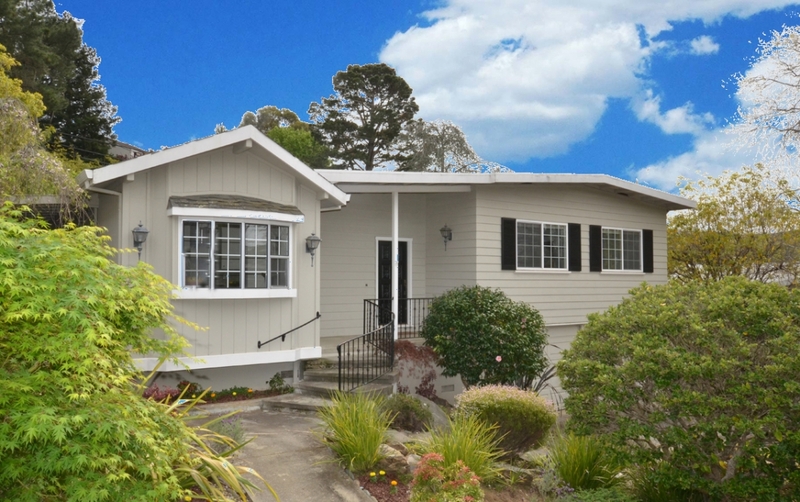 This expanded elevated ranch home has three bedrooms and two full baths on the main level. A recently updated kitchen boasts marble counters, and brilliant white cabinetry. A stainless five burner gas stove is the centerpiece of this expanded kitchen, and is surrounded by glass block backsplash. The large living area opens to a rear yard with multiple areas for entertaining and a level grass play area. Enjoy gardening in your own yard, sipping a refreshing beverage on the patio or raised deck, and even having a cookout—rain or shine—under the covered side patio adjacent the kitchen. Adorned with swank engineered hardwood flooring, the main living area boasts a centerpiece wood -burning fireplace, recessed LED lighting, a celestial skylight and refined crown molding. Down the hall is the main bathroom with retro tile work, and three bedrooms including an owner’s ensuite with vogue remodeled bath. At street level is an oversized two-car garage which includes sectionalized bonus areas of semi-finished basement space for storage or activity rooms such as an office or workout room. This location is coveted for its convenient access to transportation corridors and the Carlmont Village Shopping Center which offers a variety of retailers, restaurants and popular gathering spots, such as Starbucks, Vivace Ristorante and Waterdog Tavern featuring craft cocktails and pet-friendly outdoor dining. Other businesses include Bank of America, ACE Hardware, and the upscale Lunardi’s Grocery. For shopping, Hillsdale Mall is a short drive away and has almost completed an entire renovation, with stores such as Nordstrom, Macy’s, Williams-Sonoma, Sephora and Trader Joe’s. One can savor dining options at the new Dining Terrace or Paul Martin’s American Grill, The Cheesecake Factory, California Pizza Kitchen, and The Counter. Belmont is ideally located on the Peninsula between the Silicon Valley and San Francisco. It’s popular because of its proximity to major travel arteries—Highways 101, 280, 92. Caltrain and San Francisco International Airport is also conveniently nearby.